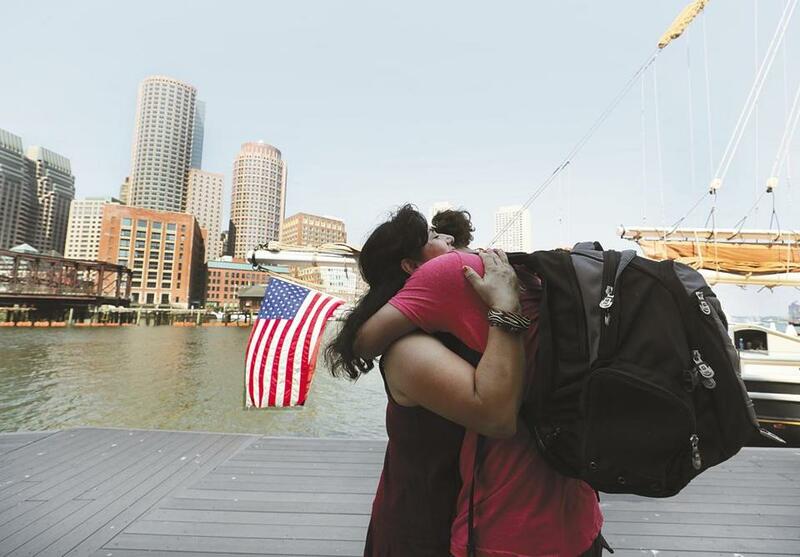 Ana Contreras greeted son Antonio Tello after his return to land from the Boston Day and Evening Academy’s three weeks at sea. Learning how to steer a ship, coil its rigging line, and raise its anchor doesn’t fit the stereotype of summer school, but for 15 students from the Boston Day and Evening Academy this has been the curriculum for their summer at sea. Dozens of parents, friends, and family this week eagerly awaited the return of the Roseway, the ship on which students have been learning the basics of sailing while studying ecology at stops along the way to New Brunswick, Canada. And as students descended from the deck of the ship to the Moakley Courthouse Dock, they greeted their friends and family with hugs and tears, still in awe of their 19 days at sea. The experience was made possible by World Ocean School, a Boston nonprofit providing educational experiences at sea, and the 5th Quarter of Learning initiative, a collaboration between Boston Public Schools and Mayor Martin J. Walsh. In its inaugural year, the initiative is offering opportunities for students to continue learning when school is out of session, and in this case, explore areas they’d otherwise never get the chance to see. Students of the Boston Day and Evening Academy have had challenges in traditional classroom settings, struggling with attendance, the learning environment, or the curriculum. Andrea Kunst, the academy’s director of advancement, said the program ensures students progress based on knowledge, not on compliance. “Things like homework and absences don’t become a part of their grade, because they really don’t have anything to do with whether or not the student knows the content,” Kunst said. And while these students are familiar with a nontraditional learning environment, it has never been quite this nautical. Mornings at sea started at 7:30 a.m., an hour that most high-schoolers aren’t well acquainted with during summer months. After taking a few minutes to brush their teeth, they’d assemble into whatever watch group they were assigned, from administering breakfast to cleaning the deck or bunks. “At first, everything was really stressful, but toward the end I feel like we pretty much came into our own,” Gonzalez said. Partial funding for the experience came from a mix of grant money from the 5th Quarter initiative and funding from BPS and the academy, a total of about $55,000. Additional costs of about $100,000 were covered by World Ocean School through donations and sponsorships. For students, the experience was priceless. “Every day on the boat tests your human capability,” said Waldy Rivera, a student onboard. Rivera, 20, said his favorite job was steering the ship, but he especially cherished the little moments he never considered to have a significant impact — like the mesmerizing experience of simply seeing the stars. “I saw satellites, shooting stars, the Milky Way, and different colorations of purple and green,” he said. Maybe it’s the close living quarters — for 27 people, including crew and staff, personal space became a luxury of the past — or unfamiliar faces becoming friends, but Rivera said there’s something about sailing that brings people who were once strangers together. “It teaches you unity, it teaches you trust, it teaches you hard work,” he said. As for sailing again, Rivera said he absolutely wants to experience another voyage. Or better yet, he’d prefer to just stay on the boat.